With your wedding day drawing near why not take this fantastic opportunity to indulge in your one and only ultimate fantasy. This is your perfect chance to treat yourself to an unforgettable James Bond experience. Your beautiful bride to be has planned her perfect wedding day, she has a luxurious Rolls Royce Phantom taking her to the ceremony, she has beautiful pink roses in her bouquet, she has even bought her dream dress and has every other detail planned to perfection. 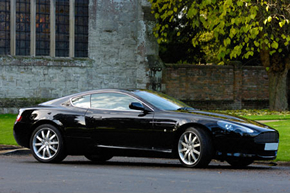 So why not have your own dream made real as well and arrive in exhilarating James Bond style to your ceremony. Imagine, you’re dressed to kill in your debonair spy attire, you have all the gadgets, you’ve finished off your vesper martini “shaken not stirred” and are ready to jump into your very own chauffeur driven Aston Martin wedding car. This will be your most invigorating experience yet and will be the most memorable and unmistakable ride of your life. Due to James Bonds love of fast cars throughout Ian Flemings novels, the Aston Martin Phenomenon was brought to the silver screen, giving these fascinatingly glamorous cars, a prestigious star status in their own right. The powerful speed and timeless beauty of the thrilling Aston Martin will definitely be a head turner that will leave your wedding congregation with long lasting surprise, adoration and envy. With Casino Royal rekindling the long-lived love affair for James Bond to pretty much every woman in the universe, your new Bride will be truly impressed and over whelmed by what a suave and exhilarating groom, she is lucky enough to be committing to on this very special day. We will help you to choose from our many Aston Martin models, all of which are as dynamically invigorating as MR 007 himself. We are also extremely passionate about the evolutionary development of the stylish and elegant Aston Martins and will therefore find you the most perfect suitor for your special day. Whether it is the DBS from the newest movie Casino Royale or its illustrious predecessors, including the Aston Martin DB9 that you prefer, we will make your special day as thrilling as a Bond movie. With the Aston Martins intense acceleration, beautifully sounding sports exhaust and the amazing engines that can reach 60mph in just 4.9 seconds your technically minded spectators will be excitably stimulated. While your other friends and family will appreciate the stunning curvaceous body and seductively breathtaking looks that these fantastic cars have to offer. At a price of £100,000 new you couldn’t put it on your gift list. But you could have a package put together for your budget so you too get the chance to be as suave, sophisticated and dynamic as Mr 007 himself.